UFC on FOX 16 goes down Saturday night in Chicago, and four alumni of the Intimidation brand are all in action on the MMA world’s biggest stage. Jessamyn Duke, Daron Cruickshank, Ben Saunders and Jessica Eye each have big fights, each in their own way. In likely the most high-profile fight of each fighter’s career, Saturday night could determine the fate of each fighter as they move forward in the UFC rankings. For Eye, a title shot against Ronda Rousey may be next, for others their jobs may be on the line. Kicking off the night’s card for the Intimidation Clothing alumni is Jessamyn Duke, fighting in the night’s 2nd fight. Duke (3-2) faces off with Elizabeth Phillips (4-3) as she fights for her job after losing 2 straight following a win in her UFC debut. Intimidation sponsored Duke in her first three professional MMA fights, all under the Invicta FC banner, and released the Jessamyn Duke signature tees during her time on the popular TUF 18 program. Daron Cruickshank, a member of the UFC’s roster since the beginning for 2012, will step into the Octagon for the 12th time on Saturday night as he looks to improve his 6-4-1 UFC record. Now 16-6-1 overall, Cruickshank faces James Krause (21-7, 2-3 UFC) as he looks for his first win after a No Contest and loss in his past two fights. Intimidation sponsored Cruickshank in multiple fights in 2010 and 2011 which spurred him onto The Ultimate Fighter’s 15th season. For Ben Saunders, a second chance with the UFC has proven quite successful thus far. After an impressive 4-3 record in the UFC from 2007 to 2010, Saunders was cut and later signed with Belator MMA. Intimidation sponsored Saunders in Bellator’s Welterweight Tournament in 2011 as he continued to face many of the top 170lb fighters in the world. Now back in the UFC after a 7-3 stint with Belator MMA, Saunders looks for a 3rd straight win inside the Octagon. Finally, the biggest fight of Jessica “Evil” Eye’s career serves as the night’s main event at UFC on FOX 16. At 1-1-1 her UFC record does not scream title shot, but in a thin division looking for rivals to take on Champion Ronda Rousey, Eye’s match-up with Miesha Tate could be everything she needs to vault her into the national MMA limelight. After a 10-1 run at 125lbs where she climbed to #1 in the world in her weight class, Eye made the move to 135lbs in 2013 and signed on with the UFC to compete against the most high-profile women in the sport. While Intimidation supported her in 9 consecutive pro fights over a span of four years from 2010-2013, the company created the Jessica Eye signature tee in both men’s and women’s styles which the company sold at many of her fights in and around Cleveland. While none of these great athletes will be donning Intimidation Clothing on Saturday night, each played an important role in helping build the Intimidation brand over the years. We wish each fighter the best of luck as they look to advance on the highest profile stage in Mixed Martial Arts. Intimidation Clothing‘s continued support of women’s MMA has been consistent throughout the brand’s history, and now with the recent growth and its inclusion in the UFC, Intimidation alums are being given the chance of a lifetime to compete on the world’s biggest stage. Two female Intimidation alums will be in action at UFC 170, which could be one of the biggest nights in women’s MMA history: Sara McMann will face Ronda Rousey for the UFC women’s bantamweight championship, and Jessica Eye faces Alexis Davis for a potential shot at the title somewhere down the line. McMann (7-0) has sponsored by Intimidation during her unbeaten MMA career at a 2012 victory over Hitomi Akano at ProElite 3. The 2004 Olympic silver medalist wrestler also won the Invicta FC bantamweight championship. She made her UFC debut with a win over Sheila Gaff at UFC 159 last April. Eye (11-1) has been one of the cornerstone fighters of the Intimidation brand, being sponsored throughout much of the early part of her pro career. The popular Ohio-based fighter has her own signature shirt from Intimidation in both men’s and women’s styles, and IntimiationClothing.com is also the home of her “Eye Believe” line. She competed mostly for the Intimidation-sponsored NAAFS organization prior to making her UFC debut, although she was also 3-0 under the Bellator MMA banner. Eye is set to take on Canadian Alexis Davis in the night’s featured preliminary bout. Intimidation has long been a supporter of women’s MMA, sponsoring such fighters as Jessamyn Duke, former world title challenger Jan Finney, rising top-ranked amateur star Jessica Zomcik, and many more. Intimidation also recently released an exclusive “I Love #WMMA” tee last year to show even more support for Women’s MMA. Intimidation Clothing is a fast-growing brand of lifestyle clothing & MMA training gear with a growing national presence and over 50 authorized dealers across the USA. Known as the biggest supporter of local MMA, the Intimidation brand is also regularly featured on multiple sporting events on SpikeTV, AXS TV, SportsTime Ohio, MTV2, FUEL TV, The Comcast Network, Comcast SportsNet and EpixHD as well as MMA highlight shows on Spike TV, AXS TV and more. In addition to over 110 styles of high-quality, bold t-shirts and sweatshirts for men, women and children and is also known for their premium-quality EliteFighter MMA board shorts. Anyone interested in becoming a dealer can apply to sell the Intimidation brand as a dealer and they can be found for sale online at IntimidationClothing.com. Fans can also follow the marketing wing of the Intimidation brand, Intimidation Interactive Media, @IntimidationIM, like Intimidation Clothing on Facebook or follow @IntimidationMMA on Twitter. One of the most high profile members of Team Intimidation is now a part of the world’s biggest organization. Top-ranked female fighter Jessica “Evil” Eye (10-1) has signed a multi-fight deal with UFC, according to multiple reports and is expected to debut sometime this fall against an opponent to be named. Eye, who was ranked #1 in the women’s 125lb weight class, will make the move to 135lbs for the first time as a pro as she looks to make her mark in the UFC. Eye, who was released from her Bellator MMA contract last week after the organization dissolved its women’s division, is currently riding a 7-fight winning streak, including a 3-0 record inside the Bellator cage. Most recently, she headlined NAAFS: Fight Nite in the Flats IX in June, when she defeated veteran Carina Damm in one of the best fights so far this summer. Most known for her finish of former Bellator women’s champion Zoila Gurgel in under a minute, Eye is one of the most popular female fighters and perhaps the most popular fighter in her home state of Ohio. Eye is a member of the Strong Style Fight Team, which is an official Intimidation dealer and also features Intimidation sponsored fighters Brian Rogers, Forrest Petz, John Hawk, Nick Duell, and more. Along with Rogers, the two recently spoke to students at Pymatuning Valley Middle School about life choices, making good decisions, bullying, self image and more. Eye and Rogers signed autographs afterwards for many of the students in attendance. Eye is also the creator of the Eye Believe signature line of apparel, which can be purchased exclusively through IntimidationClothing.com. Intimidation Clothing is a fast-growing brand of lifestyle apparel & MMA training gear with a growing national presence and over 50 authorized dealers across the USA. The Intimidation brand is regularly featured on multiple sporting events on SpikeTV, AXS TV, SportsTime Ohio, MTV2, FUEL TV, The Comcast Network, Comcast SportsNet and EpixHD as well as MMA highlight shows on Spike TV, AXS TV and more. In addition to over 110 styles of high-quality, bold t-shirts and sweatshirts for men, women and children and is also known for their premium-quality EliteFighter MMA board shorts. Anyone interested can become a dealer by applying to sell the Intimidation brand which is also available for sale online at IntimidationClothing.com. Fans can also follow the marketing wing of the Intimidation brand, Intimidation Interactive Media, @IntimidationIM, like Intimidation Clothing on Facebook or follow @IntimidationMMA on Twitter. 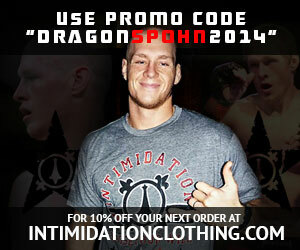 Intimidation Clothing has long been a staple on the Midwest MMA scene, and Saturday night that was evident once again. While the brand served as a main sponsor of both the NAAFS and Colosseum Combat MMA pro/am events in Ohio and Indiana, as well as an event in South Carolina, the brand sponsored fighters at each event as well as in Michigan. Intimidation continues to prove to be the biggest supporter of local MMA in the region as a benchmark was set at Saturday’s NAAFS: Fight Nite in the Flats IX event in Cleveland. At the event held at the Jacobs Pavilion in The Flats, all six winners in professional bouts were sponsored by the Intimidation brand. Those winners included #1 ranked female flyweight Jessica Eye (pictured, left), new NAAFS interim lightweight champion Torrance Taylor, UFC veteran Forrest Petz, rising lightweight star George Comer and more. Intimidation also had a record breaking night at its official booth which featured over 50 different styles of Intimidation products as well as gear from Jessica Eye’s popular EYE Believe brand along with Soulless Clothing, Headlock Gear and Victory Fight Gear. Top ranked flyweight Jessica Eye returned to action for the first time since upsetting former Bellator women’s champion Zoila Gurgel in December, and the Cleveland native picked up her seventh straight win with a clear cut unanimous decision over veteran and Brazilian Jiu-Jitsu black belt Carina Damm. Also sponsored by Intimidation partner Cast Iron Supplements, Eye is one of the most popular fighters in Ohio and continues to be one of the faces of Intimidation Clothing. Meanwhile, Eye’s longtime teammate at StrongStyle Martial Arts, Forrest “The Meat Cleaver” Petz, announced his retirement from MMA after nearly 40 professional fights and two stints in the UFC. Fans were treated to the last fight from Ohio legend as the veteran and fan favorite took home a gritty decision win over top prospect Chris Curtis in a 170-pound affair that was clearly the fight of the night. Petz showed off his impressive boxing skills to take home a unanimous decision in his final appearance in the cage. Torrance Taylor picked up his fifth straight victory and third TKO in less than a year, as he claimed the organization’s interim lightweight title with a fourth round TKO victory over Terry Blackwell. Taylor continues to be one of the rising stars on the Ohio MMA scene and mentioned after the fight his desire to make it to a larger organization in the near future. Now training extensively with the Strong Style Fight Team in Cleveland, Taylor seems poised to indeed take that step as he seemingly has really turned a corner in his career. Lightweight George Comer continues to inch toward a potential NAAFS title shot, as the GriffonRawl product earned his third straight victory with a unanimous decision over Brian Camozzi in one of the evening’s featured pro bouts. Both fighters came into the fight with lots of hype, with Camozzi being the younger brother of the UFC’s Chris Camozzi and Comer training at GriffonRawl with UFC veteran Jason Dent and Donny Walker. But it was Comer’s wrestling that won the fight, as he imposed his will and stayed in control for the entire 15 minutes to take home a sweep decision win. Other pro fighters sponsored by Intimidation on the card were Hector Urbina and Maxim Grishin as well as Terry Blackwell, Nick Duell and Brian Camozzi. Amateurs RJ Buck, Jerrell Hodge and Sammy Callari were also sponsored by the brand. Along with sponsoring the NAAFS event, Intimidation also served as a sponsor for Colosseum Combat XXV in Kokomo, Indiana. One of the best-run organizations in the Midwest, Intimidation had another successful night as UFC and Bellator veteran Ryan Thomas picked up a win in the main event to earn the organization’s welterweight title while sponsored by Intimidation. Thomas, sponsored by Intimidation for the first time, picked up his 4th straight win to improve to 16-7 in his 7-year pro MMA career. Meanwhile, at Big John’s MMA in Northern Michigan Brett Sbardella (pictured, right) picked up a victory via arm bar just 37 seconds into his bout to improve his pro record to 5-2. Intimidation Clothing is a fast-growing brand of lifestyle apparel & MMA training gear with a growing national presence and over 45 authorized dealers across the USA. The Intimidation brand is regularly featured on multiple sporting events on SpikeTV, AXS TV, SportsTime Ohio, MTV2, FUEL TV, The Comcast Network, Comcast SportsNet and EpixHD as well as MMA highlight shows on Spike TV, AXS TV and more. In addition to over 110 styles of high-quality, bold t-shirts and sweatshirts for men, women and children and is also known for their premium-quality EliteFighter MMA board shorts. Anyone interested in selling the Intimidation brand can apply to become an Intimidation Clothing dealer and Intimidation products can be found for sale online at IntimidationClothing.com. Fans can also follow the marketing wing of the Intimidation brand, Intimidation Interactive Media, @IntimidationIM, like Intimidation Clothing on Facebook or follow @IntimidationMMA on Twitter. Intimidation Clothing has been a longtime sponsor of Jessica “Evil” Eye, and the top-ranked Northeast Ohio native will return to the cage on June 1st when she faces veteran Carina Damm in the main event at NAAFS: Fight Nite in the Flats IX in Cleveland, Ohio. Joined by Intimidation in sponsoring Eye will be a first time sponsor of the top-ranked female flyweight in the world, Cast Iron Supplements. Eye (9-1) is currently ranked as the No. 1 female flyweight in the world, stemming from her December victory over former Bellator women’s champion Zoila Gurgel at Bellator 83. She is also currently riding a 6-fight winning streak, including a 3-0 record inside the Bellator cage. The uber-popular Queen of Ohio MMA is expected to be one of the building blocks of a Bellator women’s tournament in the near future, but for now she’ll return to her backyard for at least one more fight. She is also the creator of the Eye Believe signature line of apparel, which can be purchased exclusively through IntimidationClothing.com. Eye is a member of the Strong Style Fight Team, which is an official Intimidation dealer and also features Intimidation sponsored fighters Brian Rogers, Forrest Petz, John Hawk, Nick Duell, and more. Along with Rogers, the two recently spoke to students at Pymatuning Valley Middle School about life choices, making good decisions, bullying, self image and more. Eye and Rogers signed autographs afterwards for many of the students in attendance (pictured, right). Eye’s newest sponsor, Cast Iron Supplements, features a variety of products specifically engineered to build lean body mass, burn fat and provide the critical vitamins the body needs for optimal health. They can be found online at CastIronSupplements.com or on Twitter @CastIronSupps. Along with sponsoring Eye, Intimidation Clothing will also serve as a presenting sponsor for Fight Nite in the Flats IX and will be on hand selling its popular brand of t-shirts, hats, hoodies, fight shorts, and more. Intimidation is also set to sponsor pros Torrance Taylor, Terry Blackwell, Jason Dent, Forrest Petz, Brian Camozzi, Nick Duell, Maxim Grishin, and several amateurs on the card. Intimidation Clothing is a fast-growing brand of lifestyle apparel & combat sports training gear based in Ohio with a strong presence throughout the Midwest USA and a growing national presence. The Intimidation brand is regularly featured on multiple sporting events on SpikeTV, AXS TV, SportsTime Ohio, MTV2, FUEL TV, The Comcast Network, Comcast SportsNet and EpixHD as well as MMA highlight shows on Spike TV, AXS TV and more. In addition to over 110 styles of high-quality, bold t-shirts and sweatshirts for men, women and children and is also known for their premium-quality EliteFighter MMA board shorts. Intimidation products can be found for sale online at IntimidationClothing.com and fans can follow the marketing wing of the Intimidation brand, Intimidation Interactive Media, @IntimidationIM. Follow Intimidation Clothing on Facebook and @IntimidationMMA on Twitter. (PRESS RELEASE) Intimidation Clothing, LLC is thrilled to announce that IntimidationClothing.com is now the official new home of Jessica Eye’s “Eye Believe” branded merchandise. Seen regularly on the backs of droves of fans at each of her fights, the variety of colors of “EYE Believe” t-shirts have become a favorite for fans of the world’s top-ranked female flyweight. Two shirts are currently available for sale on IntimidationClothing.com with expansion of the line planned. Several new designs for men and women are already in the works and expected to be released during the Spring of 2013. As a supporter of Eye since the beginning of her professional career, Intimidation Clothing recently announced an extended deal with the popular fighter that keeps her a part of Team Intimidation for the foreseeable future. Most recent ly, Eye picked up the biggest win of her career by securing a 58-second submission over former Bellator women’s champion Zoila Gurgel at Bellator 83 in December 2012. The win was the sixth straight for Eye, which includes a 3-0 record in the Bellator cage. Now 9-1 as a pro, Eye was a perfect 4-0 in 2012 defeating Kelly Warren, Anita Rodriguez, Angela Magana and Gurgel. She is also the reigning Ring of Combat Women’s Champion having defeated Ashley Nee in February 2011 by 1st round TKO. A product of the Strong Style Fight Team, Jessica Eye (@JessicaEvilEye on Twitter) trains alongside many of the top fighters in Ohio including UFC heavyweight Stipe Miocic, Bellator middleweight Brian Rogers, UFC vets Forrest Petz and Jeff Cox, and regional MMA stars Nick Duell, John Hawk, Joe Heiland and more. A longtime member of Team Intimidation, Eye has also headlined three cards for the popular Intimidation-sponsored NAAFS organization and was the first NAAFS female champion as an amateur during her perfect 5-0 amateur career. Intimidation Clothing is a fast-growing brand of lifestyle apparel & MMA training gear based in Ohio with a strong presence throughout the Midwest USA and a growing national presence. The Intimidation brand is regularly featured on multiple sporting events on SpikeTV, AXS TV, SportsTime Ohio, MTV2, FUEL TV, The Comcast Network, Comcast SportsNet and EpixHD as well as MMA highlight shows on Spike TV, AXS TV and more. In addition to over 110 styles of high-quality, bold t-shirts and sweatshirts for men, women and children and is also known for their premium-quality EliteFighter MMA board shorts. Intimidation Clothing products can be found for sale online at IntimidationClothing.com and fans can follow the marketing wing of the company on Twitter, Intimidation Interactive Media, @IntimidationIM. Follow Intimidation Clothing on Facebook and @IntimidationMMA on Twitter.